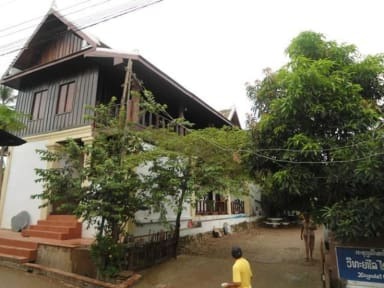 The Thony 1 House 1 is a Family run Hostel in the World Heritage Town Luang Prabang. It is a good option to stay in Town. You can better enjoy staying by your self. Luang Prabang has got 6 Years Gold Award from one the Best Magazine in UK. Please try to book our room and enjoy your stay at the Villa Thony 1 House 1. We hope and wish all our guests have very good memory at our house. Please do not misunderstanding between the Thony Guest House and the Villa Thony 1 House 1. Both Houses are situated at the same road near the Villa Merry No 1 at the Khan River. Our Staff are waiting to serve you with a warm Welcome in our Family stile. Lovely family ran guesthouse! Great location and perfect big room for a couple. Originally booked 1 night stayed for 4 nights! Would recommend! We has a wonderful stay at Villa Thony. The family is so nice and very helpful. The room was clean and comfortable with mosquito nets over the beds. Would love to stay here again! Great location, amazing and so helpfully staff. The only downside slow wifi, best to get a sim card before. We loved the young family who ran this guesthouse. Sweet baby. Quiet place, close to walk to pretty town centre, laundry 100 yds away. Good restaurants all along street. 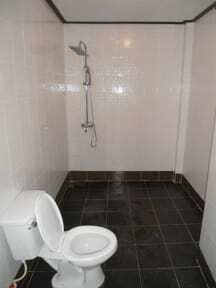 Big room, masses of hot water for shower, Tea, coffee bananas always available. The couple who own this guesthouse were so nice and helpful. However we came back at 23:45 one night and the place was locked up, so we felt bad waking the family up. That said, they didn’t complain at all. Sheets and towels had marks on them but were clean. Laundry came back cleanest we’ve had in all of SE Asia. Facilities/room quite old but can’t complain for the price. Good location for exploring Luang Prabang on foot. Not much social scene - think we were only guests, not that we minded! Lovely little family run guesthouse in LPB. The room was comfortable and clean and every request I had was met with a smile. The location is good - it's about a 10 min walk from the centre but there's lots of nice restaurants and bars closer. Would stay again. Overall it was a pretty good place. A little quiet but close enough to good places to eat and drink. Shower was broken so just sort of dripped but as we were only there to sleep for one night there wasn’t anything that could’ve been done to improve our experience. The breakfast wasn’t very nice and despite Hostelworld staying a free breakfast there was a charge. The staff were quite quiet and we found the customer service difficult. We did not end up staying in this guesthouse, as it was not what was advertised. The room we were given had a few mosquitos flying around, and a number of spiders and spider webs. Unfortunately the mosquito net that was provided had holes in it, and did not fit around the size of the bed. Other than that, the staff appeared very friendly and it would have been a good central location. Poor experience from start to finish. Staff cannot speak english. Very dirty rooms/ bathroom and sheets ( blood stains blankets. Poor wifi in rooms Booked in to stay 2 nights, with 10% deposit already paid online. We decided we couldn't stay even 1 night. Hostelworld deposit was not considered and we were made to pay the full amount in cash. For $20usd/night, much better value is found elsewhere .